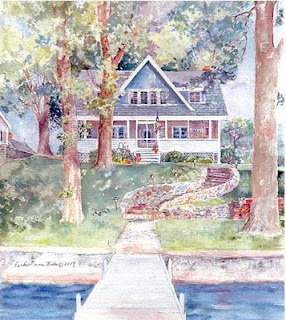 This photo of my painting of a Lake Maxinkuckee cottage was displayed here about 6 weeks ago. Soon after I published this blog, I removed the photo because the painting was to be a Christmas surprise and so should have been out of sight. I feel honored to have been asked to paint it, and here it is for you to enjoy. We have had a most pleasant holiday season, and it's not over yet! We've had nice visits with family and friends, and the hours have flown. We enjoyed our fake Christmas tree with its instant on lights, and our living room seems rather bare without it. Ward took our tree down to the basement, covered it with a sheet and parked it in a corner. A few hours later, I went down there to ride my exercise bike and had a great surprise! He had organized and straightened up much of the clutter down there. How very nice of him. Here is a photo of our Culver Inn print, one of the most popular of our Culver Academy series listed on our Painter and Poet web site. The Culver Inn was a favorite on campus destination, a restaurant which reminded me of Williamsburg, Virginia - very elegant and charming. It was torn down about 1992 to make way for the "new" Huffington Library. We've partially set up our Painter and Poet ebay store and already have one print on it - Balloons Aloft ebay #250559660146, and have just put a Culver Inn print there for sale. 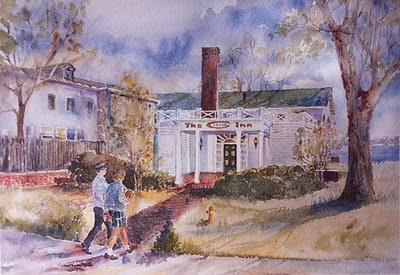 The Culver Inn print is ebay #250562161957. Soon I hope to have links between this blog, our ebay site, and our website. The base prices are lower on ebay than on our web site www.painterandpoet.com so you may be able to get a bargain on ebay. I'm hoping that the mental gymnastics from all of this computerizing will substitute for the crossword puzzles I do not do. Ward is the expert in that department. Studio Update: Am working now on grandson Michael's watercolor, and will photograph it and show it to you on our next blog. It has been very cold with some deep snow and ice. Last week, we did not open up until the weekend - walks were too treacherous. I've completed some small drawings on heavy watercolor paper, and will be working on those - between larger paintings. When completed, they will be put on ebay for bidding. These will be one of a kind, no prints. However, we will take careful photos of each, and if you buy an original, it would be possible for you to purchase some custom notecards featuring your painting.